After a two-week break for Christmas and the New Year, a party of eight Wellington-booted volunteers assembled at the start of the circular path around Seaton Sluice estuary. This previously popular path, especially on the west (cottages) side, has taken a real hammering from the wet weather of the past seven months as well as the mine water seepage, so much so, that the path is now really only passable to people wearing heavy or Wellington boots. Together with the weather, on the east side, the path was also subjected to the leaks from the interceptor pipes/housing that, for a long period at the end of last year, made passage extremely difficult. 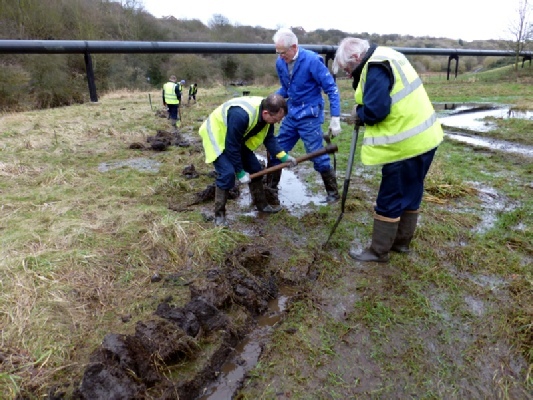 Adjacent to the interceptor housing a new raised stretch of path has been put in with drainage pipes under the path and it was the final creation of the gullies to these pipes that first occupied the volunteers today, working ankle deep in mud! 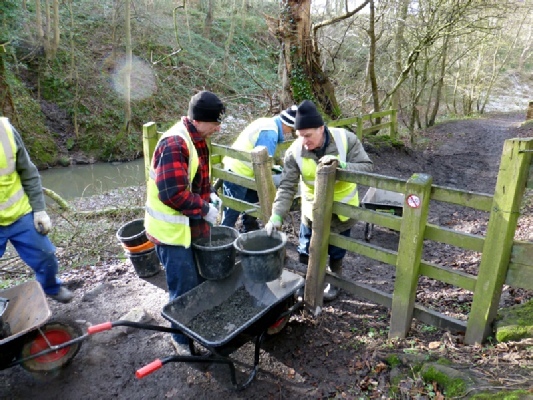 The photograph shows the new path and one of the inserted pipes with the volunteers doing the digging. At the same, two volunteers tackled the dividing fence between Hartley West Farm and the Dene near the metal bridge that had been reduced to being almost horizontal by the heavy floods and debris that hit the area at the end of last year. The cows, before they were taken in byre for the winter, simply walked over it. Additional posts were put in while the original ones were made vertical and then the netting and barbed wire were re-stapled to the posts. The last part of the morning session was taken up trying to remove some of the areas of lying water on the paths by creating small drainage channels. Some were successful, some not. In a number of cases it was impossible to do, as the surrounding area was as flooded as the path and the water had nowhere to go. There are no reports for the Working Party sessions on the 15th and the 22nd January because, for the first time in thirteen years, consecutive sessions had to be cancelled, due to the snow and ice in the Dene. Over this period there were clear illustrations that the Dene has its own climate. On a number of occasions during this snowy period, the roads and surrounding fields were completely clear of snow, whereas, in the Dene there were stretches of ice and the paths were covered in snow; icy overnight and slushy by the end of the day. The volunteers were pleased that the 29th dawned dry and reasonably warm and seven assembled for a job that had developed dramatically since earlier in the month. It was around the 8th January that our attention was brought to a slight subsidence on a short stretch of a path near the metal bridge at the head of the estuary at Seaton Sluice. The Council kept watch, the adjacent trees cut back, the subsiding area taped off and warning signs were erected. A site meeting between the Council and FoHD was arranged, with a view to FoHD carrying out remedial. After the snow thaw the river rose to almost flood levels and by the time the representatives arrived on site to view the path and decide what was to be done, the path had subsided even more and it was close to an emergency situation. The volunteers arrived the following day with the aim of widening the whole path so it could remain open as it passed the area of the subsidence. 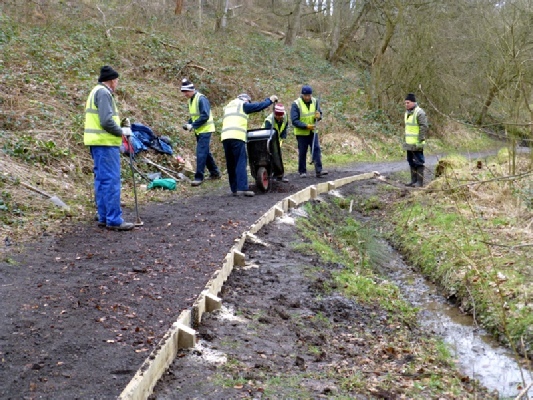 The second photograph shows the volunteers starting to widen the path. 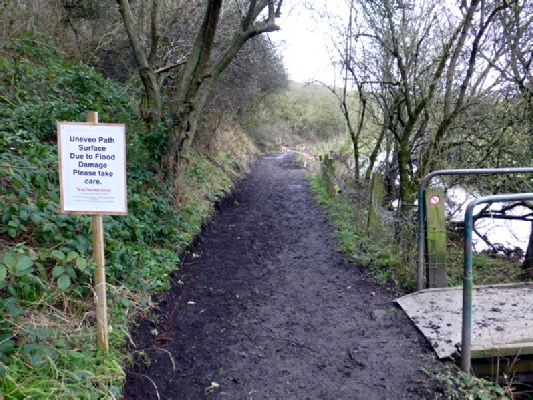 The path was widened either side of the subsidence to make it as safe as possible for walkers runners and horse riders. The fourth photograph shows the finished path. Having completed that task, the volunteers turned their attention to a path on the opposite side of the river but in the same area. 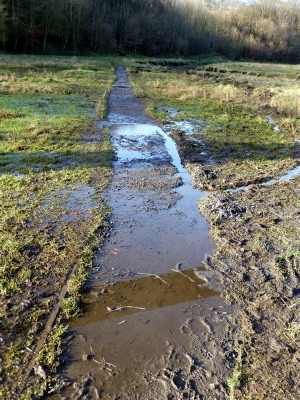 A low-lying straight length of path with bogs on either side, which had been flooded for months and was difficult to drain as the ground rose slightly between it and the river. It was decided to dig a trench parallel to the path with two connecting trenches spaced along the path. The fifth photograph shows the volunteers digging the parallel trench and well illustrates the boggy working area. Getting the correct levels on the trenches was impossible to do in the time available and because so much water was flowing to and fro as digging proceeded. The sixth photograph shows the path 24 hours after Tuesday finish. Clearly not perfect but a dramatic improvement and the path is once more useable to walkers not wearing Wellington boots. A slight covering of snow overnight, gale force winds blowing, the thermometer showing 0 degrees (wind chill –6) and with ice underfoot, made the decision as to whether the session should be cancelled or not, a difficult one. The decision made, eight volunteers assembled, with many layers of clothing to keep out the cold, at the usual time of 08.30. A brisk walk upstream to the area between the two wooded bridges saw the group quickly into action, it being the only way to restore circulation! The first task was to remove all the leaves, loose soil and mud from the stretch of path to be re-stoned. Towards the end of this cleaning task the difficult supply of stone was commenced. The problem resulted from the need to get the stone over a stile. This was done by filling buckets with stone, transporting the buckets to the stile in wheelbarrows, passing the filled buckets over the stile and emptying them into other waiting barrows. 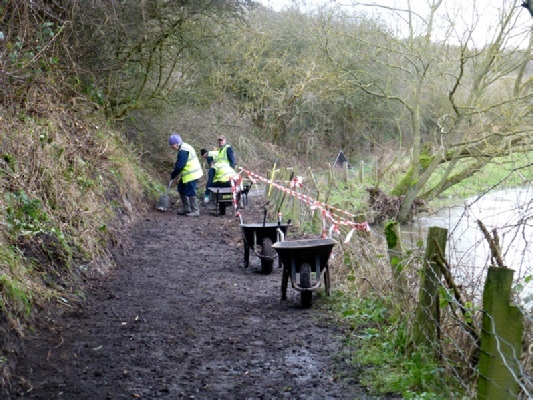 Then came the relatively easy part, wheeling the barrows upstream to the re-stoning site, emptying, raking and thumping. This whole operation was tedious, slow and extremely tiring and, considering the volunteers worked for four hours, with only two short breaks for sustenance, the length of path actually re-stoned was, to say the least, small. However, the third photograph also shows the dangerous location of one part of the path in relation to the river and the obvious need to keep it in good condition. 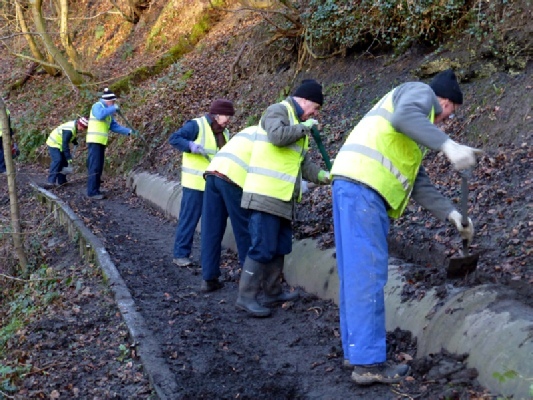 On a cold, dry winter’s morning, with the odd snowflake floating around in the wind, ten volunteers reported for the usual Tuesday morning Holywell Dene work session. It was a morning of doing smallish jobs, which had been outstanding for some time, that were beginning to join the urgent category. 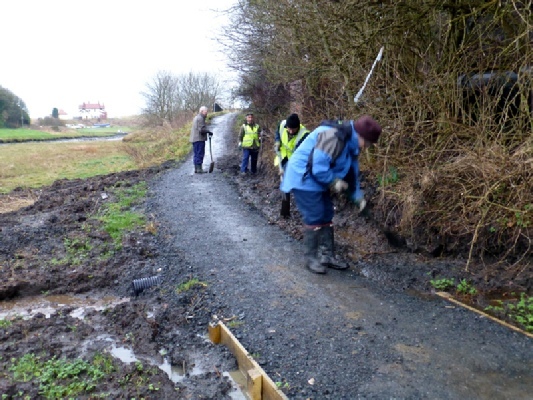 Two volunteers joined our Northumberland Council’s liaison man to continue work on the estuary path near the metal bridge. 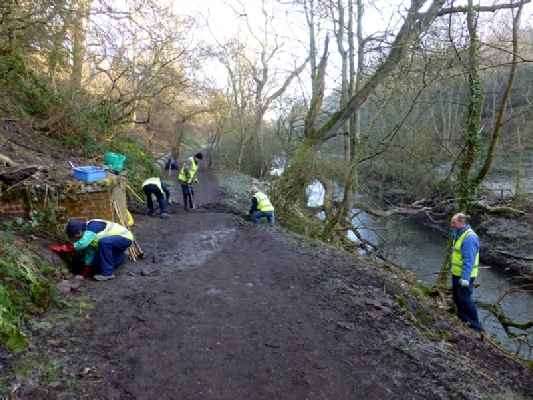 (See report for 29th January) The trees/bushes on the riverbank, that were thought to be the main cause of the path subsidence, were being removed and it was the completion of this task that the volunteers were involved with. In addition, they helped remove two other trees on the same path, that were causing height restrictions for horse riders. Meanwhile the other volunteers assembled on the Hartley West farm road to carry out remedial work on the two stiles into the Dene from that road. The top stile, adjacent to the metal gate, originally had a step up to the stile but about a year ago this was accidentally demolished when a large load of stone was unloaded in the gateway. While two volunteers carried out the necessary wooden construction of the new step, the others collected stone from the dump near the stepping-stones; a long haul with a full barrow! Adjustment was also made to the gate latch, which had been a problem especially to horse riders, as to open and close the catch it was necessary to slightly lift the gate. It is now much easier. Attention was then diverted to the stile into the meadow, next to the stone bridge. The damage here had been caused by the floodwater, earlier this winter, that had cascaded down the farm road, over the bridge and into the river via the stile, taking most of the surface stone with it. Work consisted of creating wooden stone retention barriers, part of which was the creation of a second step on the meadow side. Along the junction with the tarmac road old cobbles were positioned in an attempt to divert the water further along the road during floods. Needless to say a considerable quantity of stone was needed to complete the job and a steady stream of filled wheelbarrows were to be seen coming down the farm road, after the extremely long journey from the stepping-stones. It is very difficult to determine what path water will actually take and only time will tell whether the work undertaken has made a difference. As time was rapidly running out, two volunteers donned chest waders and entered the river below the stone bridge to lubricate the hinges on the water gate. The weight of logs hitting the gate during the floods had slightly bent the gate and some rust had appeared around the hinges. However, after a good squirt or two of oil and working the gates for fifteen minutes or so, all seemed fine again. Once again only time will tell, after the next flood and when the cows and their calves are let out from their winter quarters and they do their best to find a way under the bridge into the Dene. Finally, it is good to report that the ‘ford’ on the northern bridleway has been removed by insertion of a long pipe and the path reinstated. 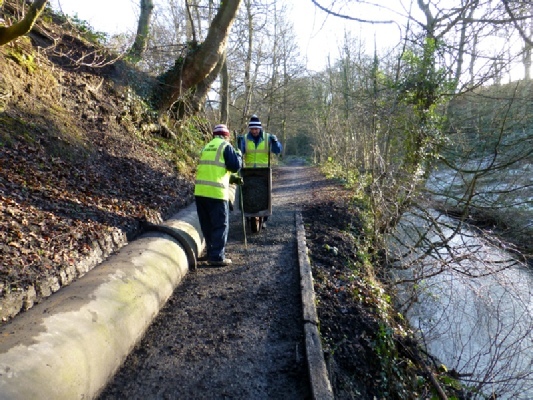 This was not work carried out by FoHD but is an illustration that Northumberland Council are doing their bit for the Dene. Once again the working party was lucky with the weather, sun to start, cloud to finish with light winds, followed by an afternoon of drizzle. Ten volunteers assembled in two different locations to carry out relatively smallish jobs before joining forces for the final part of the morning session. 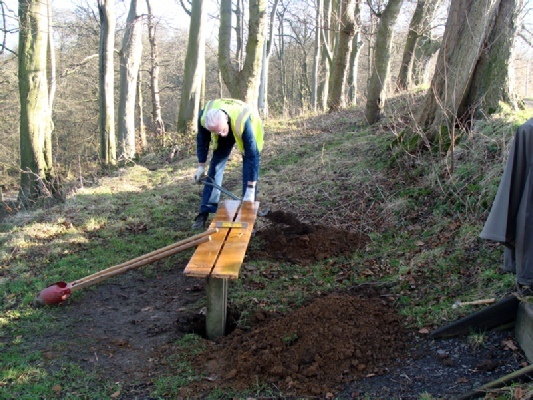 It was over a year ago that the very popular bench seat, high on the south side of the Dene, was either vandalised and thrown away, or stolen. A replacement seat was made by one of the volunteers from re-cycled material and this morning it was fixed in place. The first photograph has been included to demonstrate the difficult access frequently encountered when getting tools and materials into the Dene. In this case a fully laden wheelbarrow, including 3 bags of post cement, had to be taken across a badly rutted and sodden field. 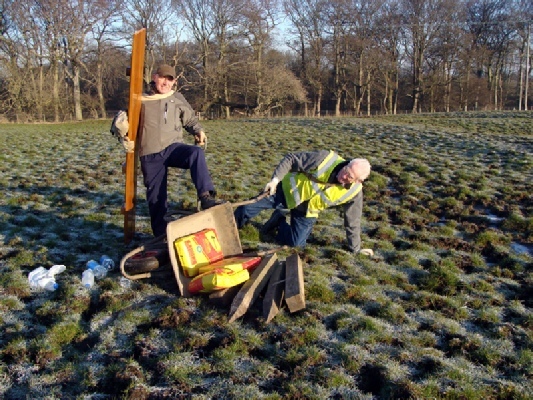 The barrow tipped and the volunteer was thrown to the ground. Luckily no one was injured but it illustrates the current state of the ground that is often encountered. Deep holes were prepared for the legs of the seat and post cement used to anchor them before soil was used for ground levelling. 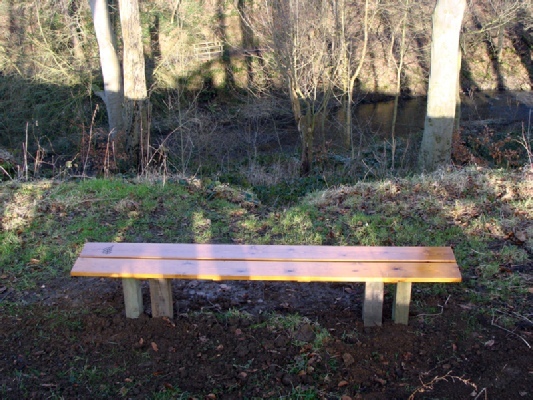 Before the seat disappeared, this was a very popular spot for visitors to rest and enjoy the wonderful view down the steep hill to the river and across to the opposite footpath. In certain weather conditions the seat exhibited some very interesting acoustic properties, allowing normal level conversations on the opposite path to be listened to with ease! 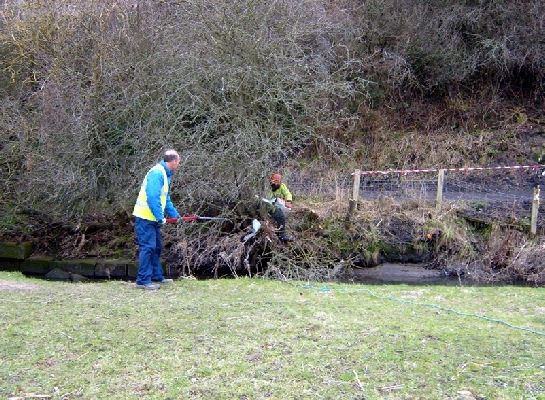 Meanwhile the second group were dealing with the two adjacent sites where water from the hillside on the north side of the Dene was crossing the footpath. The first site, nearest to the camera in the next photograph, was a pipe that had become blocked due to the silt, which this winter’s heavy rain, had brought down the hillside. Using drain rods from the river end, the pipe was quickly cleared but the sump had also to be cleared of silt and, as can be seen, a volunteer wearing rubber pond gloves performed this. A worthy effort! A short distance away another team was digging a trench to take a second pipe to deal with the water seeping over the large overflow pipe. Photograph five shows the trench work well underway. When both jobs were completed, large flattish stones were brought from the river to mark or cover the two sumps and the path covered with fresh stone barrowed from a pile a short distance downstream that had been dumped a year ago. By that stage the two groups had joined forces and the last hour or so of the morning was spent continuing the work on the footpath upstream of the stile, which was explained in detail in the Report for 5 February 2013. Today was set aside for completing jobs that were not finished, due to time constraint, during earlier Tuesday sessions. 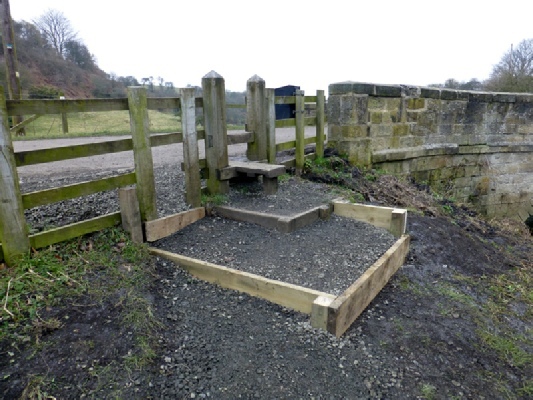 Eight volunteers assembled at the downstream wooden bridge and, using the remainder of the dumped stone in the area, completed the necessary path refurbishment upstream from the bridge, started on 5 February. As stated in the Report for that day, the major problem was getting the stone over the stile. 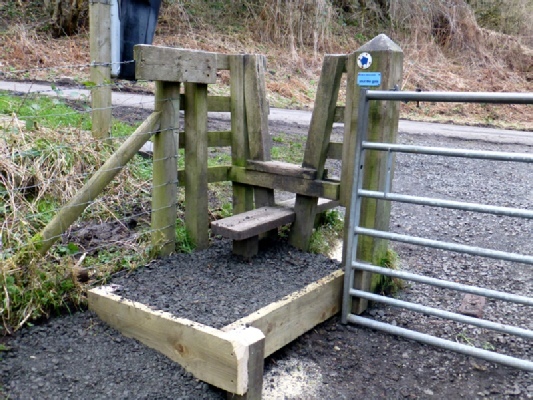 However, the part of the path still to be refurbished was much closer to the stile, so it was possible to transport the stone to the stile in buckets in a wheelbarrow and then simply empty the buckets over the stile. As always, before stoning took place, the mud on the path was raked off and, where there were puddles, drainage channels were cut to remove any accumulating water. The pile of stone exhausted, a small group of volunteers stayed in the area raking mud off the path near the junction of the three paths, certainly no easy task, while the rest moved downstream to where we worked on 19 February, inserting a pipe under the path, to channel the water coming down the hillside. Certain adjustments to the sump area at the start of this pipe were obviously needed, so while this was being carried out, more stone was brought from the next downstream stone pile, to extend the length of path re-stoned adjacent to the pipe work. In addition, an area of lying water on the path about 100 metres away, was cleared of mud, a drainage channel dug through a large bank, and the whole area given a new covering of stone. This work resulted in the next pile of stone being exhausted. Finally, on our way back to the cars at the end of the morning, three wheelbarrows were loaded with stone and taken to the stile on the SE side of the stone bridge. Keeping the groundwork of this stile above the level of the adjacent farm road is essential in ensuring floodwater, flowing down the road after heavy rain, doesn’t turn into the stile and wash away the path stone. This working session covered two days. 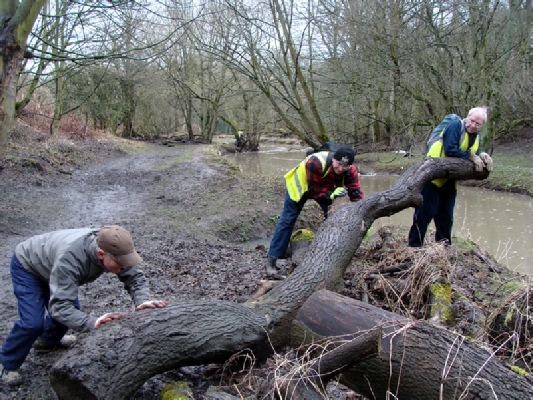 On Monday 4th March, two FoHD volunteers worked for two hours assisting the NCC staff, installing wooden edging along the path that had been damaged by the roots of a large beech tree, which had fallen across the river. Using recovered road stone, the created gap was filled to make it safe. The first photograph shows the fallen tree and damaged path. The following day, the first full Working Party in (official) spring, saw nine volunteers assemble on a cold, frosty but sunny morning to carry on the work started on the previous day. The recovered road stone had been delivered earlier to the Old Railway Line just to the north of the tunnel. 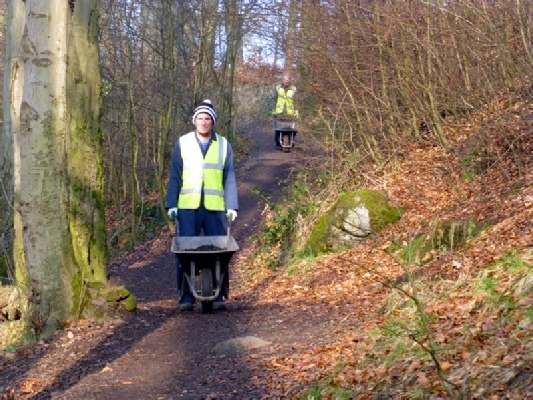 The volunteers then had the difficult and extremely tiring task of wheel barrowing it down the steep incline to the lower river path. As they were keen to point out, it was almost as tiring going back up the hill with an empty barrow, as it was coming down with a full one. The second photograph shows the loading of the stone at the high level dump. The third photograph shows volunteers gingerly descending the hill. 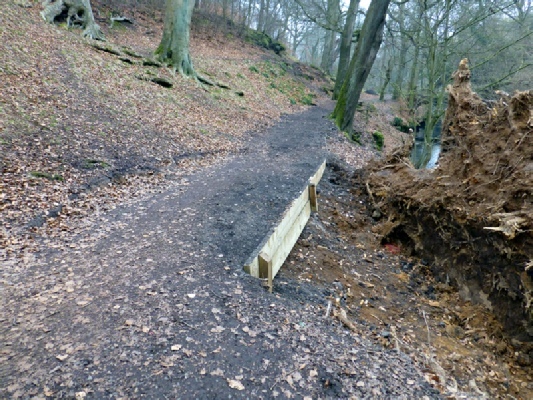 The stone was initially used on the diverted stretch of path next to the fallen tree and then was extended to an adjacent stretch of path that was muddy as the result of past lying water. The fourth photograph shows the wood edging and newly stoned path. 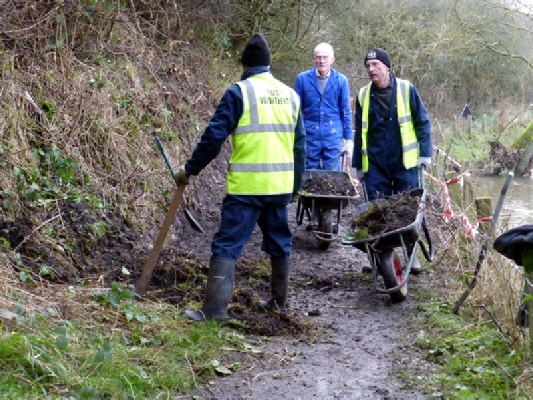 At a later stage of the session, an extremely muddy stretch of path, this time at the Old Railway Line level going towards Holywell, was cleared of mud, soakaways created and a good covering of fresh stone put down and stamped in. Then it was back to the descent of the hill again with more stone to form a dump ready for a future task near the bird-feeder bridge where part of the path has been washed away during the past heavy rain. The fifth photograph shows the low level pile of stone ready for another day. A good turnout of ten shivering volunteers gathered on the bridleway adjacent to Hartley west Farm. Underfoot the ground was solid with patches of frozen puddles and a keen NW wind was blowing across the open fields. With the work the Group had been doing on paths this winter, there were a number of small unsightly piles of stone left from previous jobs in the Dene, which it was hoped we could use up and make the areas tidy, all in one session. 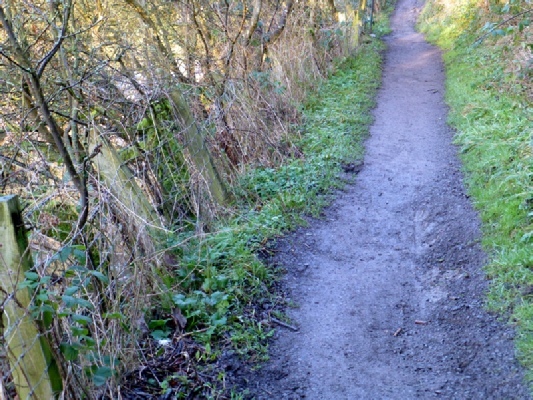 The northern bridleway adjacent to Hartley West Farm had stood up fairly well to the earlier flooding, after the refurbishment work carried out last autumn. However some extra stone was needed and this was brought from the remains of the original large pile to the west of the farm, which meant a 250 m barrowing distance that appeared to get longer as the morning wore on! The path, which is not in good condition, started hard but as the temperature rose so the ice thawed and the solid earth turned to mud. Not the easiest surface when wheeling a barrow full of stone. 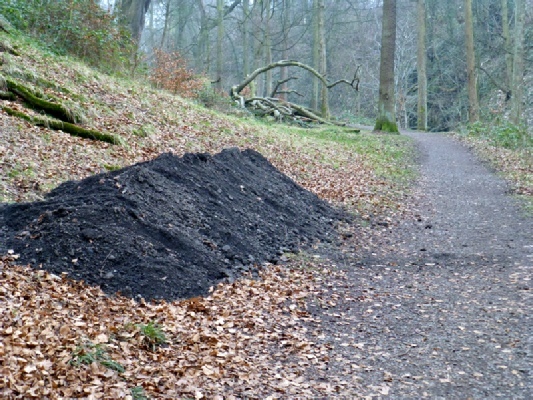 However, soon after 11am the last barrow load had been tipped, spread and raked onto the path and the group retired to the warmer lower path. As the water level was low we decided to put the barbed wire back on the water gate under the stone bridge. This is done because the gate is in two halves and, soon after it was erected, the cows found a way of separating the two halves and hence were able to get into the meadow and the rest of the Dene. For a number of years now the use of barbed wire linking the two halves has thwarted the cows efforts. Fingers crossed for this year! By mid-March, it would be expected that the cows and their calves would be out in the open fields. However, this year the grass has not grown sufficiently to allow this to happen but when it does we are now ready for them. While the wiring was going on, the remainder of the Group cleared another remnant pile of stone near the stepping-stones and barrowed it to near the stile into the meadow next to the stone bridge. The work we carried out on the steps of the stile has never been tested by heavy rain and flooding. So the stone was placed there as a precautionary measure, in case the next period of heavy rain, causing a stream to run down the farm road, washes out some of the stone from the stile area. Only time will tell. As the volunteer co-ordinator could not be present for this session, it was decided that the eight volunteers available would carry out a litter pick of the area from Dale Top to Concorde House. The river had brought down a good proportion of the litter in this area when it flooded, spreading it far and wide on both banks. Unfortunately, the remainder was either dumped or dropped by humans. The weather forecast was not good, predicting rain, snow and strong wind, but on arrival at 08.30 the weather was fair, after heavy overnight rain. 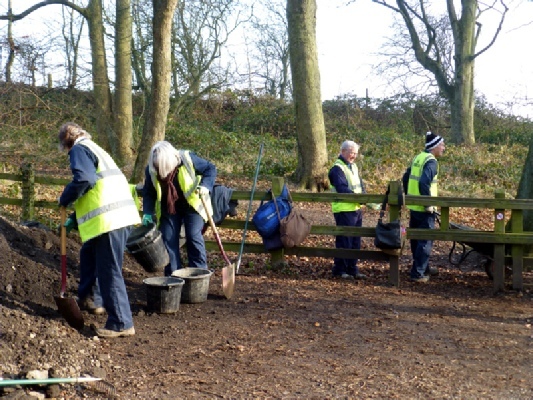 Of all the tasks undertaken by the working party, litter picking is probably the least enjoyable but just as important as other work carried out by the group. 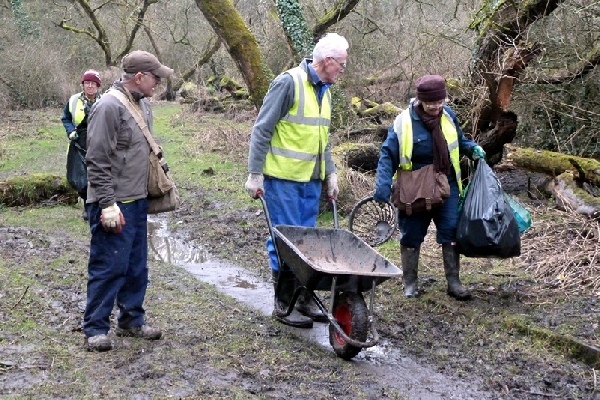 So the volunteers set off with bags, litter pickers and a wheelbarrow along the very muddy path by the riverside. 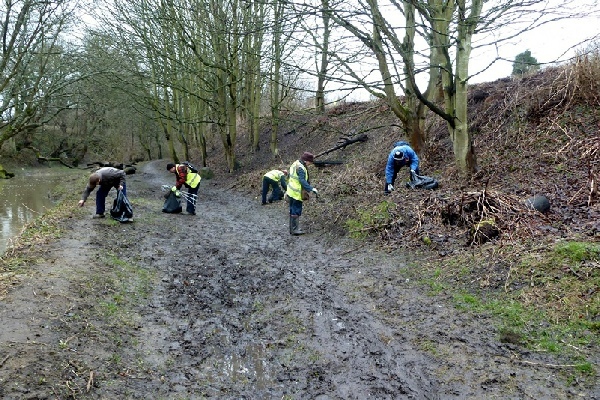 The first photograph shows the volunteers spreading out to pick up litter. 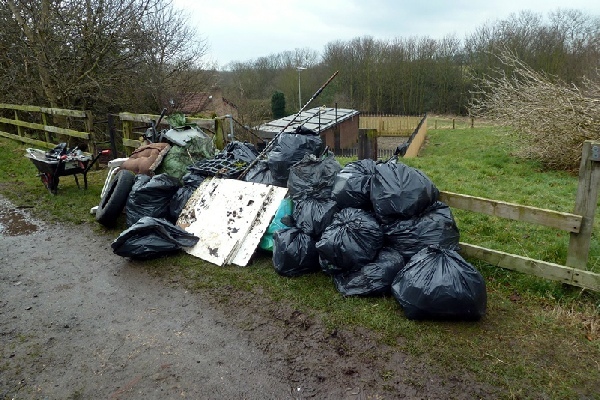 The second photograph shows the first few bags of litter collected. During the recent flooding in the Dene, a tree trunk had floated downstream and come to rest over the footpath. The removal of the trunk acted as a welcome distraction for some of the group, who made light work of re-locating it. The third photograph shows human labour moving the tree. The weather held out all morning so the volunteers stayed relatively dry, although at times the mud underfoot made it difficult to avoid slipping into the river for an early bath! The session produced 15-20 bags of rubbish as well as some more exotic items such as a golf club and balls, a bicycle frame, a plastic seat complete with cushion, a tarpaulin and the obligatory car tyres. The fruits of the morning’s labour was stacked at an agreed pick up point, which enabled Northumberland County Council to collect and dispose of the rubbish while the volunteers headed home before the snow arrived! The temperature was 0 degrees, the strong to gale force wind was blowing from the east, there were regular snow showers and the wind chill temperature was –5. So started another Tuesday for the FoHD Working Party. The location of the morning’s work was close to the upstream wooden bridge: probably one of the most inaccessible places in the Dene in respect of getting tools and equipment to site. The path slightly upstream from the bridge had been partially washed away by the heavy rain over the winter and it had been decided to put in a wooden edge and re-surface it before it became more dangerous for walkers. 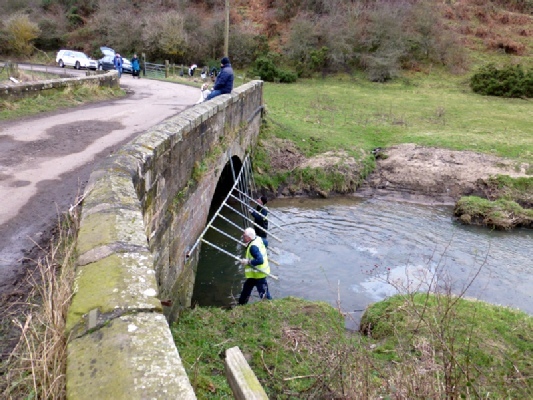 In all 10 volunteers turned out, 3 started from Old Hartley where they collected 3 wheelbarrows and walked them the considerable distance to the bridge. Meanwhile the remainder met on Hartley Lane at the entrance to Crow Hall Farm and carried all the timber edging and stakes plus all the necessary tools, spades, shovels, drills, rakes etc. initially across the field and then down to the bridge. While the stakes were hammered in and the edging attached, the stone, which had previously been brought down the steep slope from the old railway line and dumped near the tunnel entrance, (see report for 4/5 Mar 2013) was collected in the wheelbarrows and brought to the site. The stone was raked level and trodden down, stakes were angle cut and the gaps left between the edging boards were covered with chicken wire for water drainage purposes. 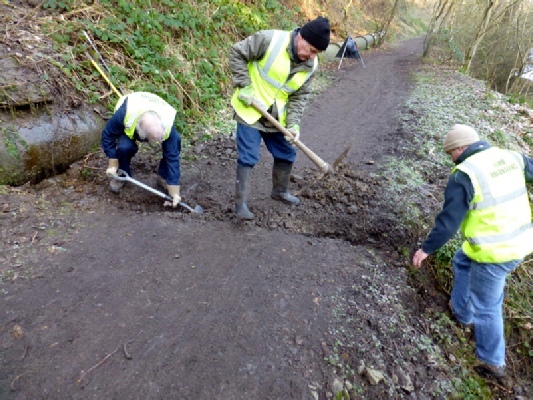 The second photograph shows the volunteers putting the finishing touches to the edged and repaired path. Two other jobs were carried out during the morning resulting from previous vandalism. The first concerned the bench seat, which had disappeared last autumn from its position high on the south side of the river. It was finally located some distance away and recovered to store for future use. The second job concerned more recent vandalism. In the last week or so it had been noticed that two of the posts with indicating signs saying “No Cycling”, “No Horse Riding” had disappeared. One was found in nearby bushes and recovered to store to await re-erection. The second one is still being sought.